On this episode of the podcast, our segment, CRAP OF THE WEEK where we spring movies on one another, unplanned and unencumbered by pesky research. First up, who knew Motown was involved in film production? Barry Gordy was the man behind the scenes for the bizarre The Last Dragon. 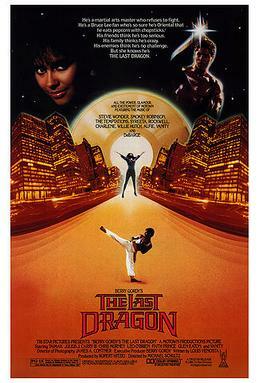 Directed by Michael Schultz (Sergeant Pepper’s Lonely Hearts Club Band and Cooley High), this martial arts exploitation musical came out in 1985 and stars Taimak and Vanity, two one-named stars a la Cher or Adele, except not famous. Set in The Big Apple, the movie follows a martial artist named Leroy Green (a/k/a Bruce Leroy), who has dreams of becoming an iconic martial artist like his idol Bruce Lee. Another martial artist, competitor Sho’nuff (!) sees Leroy as the only obstacle to being the true master of martial arts. Not surprisingly, this received a critical drubbing. Were they right? Part II of this discussion features the largely forgettable but well-executed flick Wrong Turn, which has, for some reason, generated numerous sequels. It’s a typical lost-in-the-woods slasher flick, unique in that Hamilton, Ontario substitutes for the wilds of West Virginia. Desmond Harrington (Quinn from Dexter) is a doctor who gets in a car accident and finds himself stranded in the backwoods with some cyclists whose vehicle has been disabled. Unfortunately, the woods are inhabited by cannibal inbred hillbilly psychopaths! Eliza Dushku and Emmanuelle Chriqui co-star.